Authentic replica uniforms for Napoleonic, American Civil, Plains Indian, Western, Zulu, Boer War and World War 1 periods have been researched replicated, designed & made for over 15 years by The Sutlers Stores team! The company has reverted to its original name of 19th Century Tailoring which continues the tradition of quality and durability. We only manufacture ourselves, here in our workshop in England an exceptional range of military uniforms and civilian menswear for the periods 1700 – 1910. 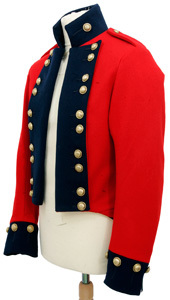 Although our authentic range of replica Frockcoats, Waistcoats (Vests), Trousers, Breeches (Fall Front) and Shirts is extremely comprehensive, we are also able to recreate almost any uniform and costume designs that were available during these times. We specialise in converting customers design ideas into reality! Our products are bought by Re-enactors, Historical Interpreters, Museums, Film, Theatre and Television Companies. Our products are in use and on display all over the world and have been seen in many top movies and plays. All of our standard tailored menswear items can be ordered through this website or for those of you who still have our catalogues, you can use mail order as before. We are happy to receive enquiries for 'Steam Punk' clothing, just send us your design and we will quote you for making it. Please note all clothing is made to your order, unless it is clearly marked as a stock item. We rarely have a quiet period and at certain times when we have corporate orders we get even busier! We ask you to always allow at least 12 weeks for delivery unless you are specifically quoted a shorter time. Due to the disruption it causes to our working day we can no longer provide a telephone number or an email address. If we were just getting calls from customers it wouldn't be a problem but we get so many unsolicited cold calls from marketing companies and also hundreds of spam emails. If you urgently need to discuss your order in person please use the contact form and we will endeavour to call you back as soon as we can. With regard to various rumours on the web, we do NOT import clothing or anything else from India, Pakistan or anywhere else, the company in India that say they supply us are not strictly speaking lying, because they once (a very long time ago) did send us some unsolicted clothing items which we promptly threw in the bin because they were awful. If you want to see our items being made you can make an appointment by email and come and visit our workshop, we are open Monday to Friday.